The Best Theme Park blogs from thousands of top Theme Park blogs in our index using search and social metrics. Data will be refreshed once a week. Also check out Top Theme Park Youtube Channels list for Top videos on Theme Park. Ipswich, UK About Blog Your guide to Walt Disney World, Universal Orlando and beyond - free guides to 90 parks, plus the latest news and fascinating articles. Facebook fans 527,850. Twitter followers 13,445. Pasadena, CA About Blog News, features, reviews and commentary on the world's most popular theme and amusement parks. Facebook fans 65,024. Twitter followers 42,601. USA About Blog Theme Park Review checks out all of the World's Theme Parks and shares their findings with you through Photos, Videos, and Trip Reports. Facebook fans 1,447,906. Twitter followers 94,774. 4. Disney Parks - Your Destination For The Latest Disney News. Facebook fans 542,837. Twitter followers 1,561,115. Facebook fans 159,105. Twitter followers 13,960. Facebook fans 67,079. Twitter followers 53,638. Orlando, Florida About Blog Your source of daily news and rumors from all of Orlando's amazing theme parks and attractions. Facebook fans 20,852. Twitter followers 7,457. Facebook fans 133,691. Twitter followers 60,532. Facebook fans 661,229. Twitter followers 154,449. USA UK About Blog Roller coaster and theme park photos, news, reviews, videos, articles and more. Facebook fans 3,082. Twitter followers 6,149. About Blog Our Passion is to cover the best theme park experiences across the world! Subscribe to our channel for ride videos, announcements, water slides and much much more! Facebook fans n/a. Twitter followers 19,650. United Kingdom About Blog Welcome to Theme Park Worldwide, full of the latest theme park news, links to our regular YouTube videos and much more! Facebook fans 20,039. Twitter followers 10,379. About Blog amusement parks, rides, & attractions, rollercoasters, theme parks, coasters. Facebook fans 66,825. Twitter followers 52,321. Facebook fans 543,590. Twitter followers 58,604. Orlando, FL About Blog Orlando Informer is the internationally awarded independent resource for guests visiting Universal Orlando Resort, Walt Disney World, SeaWorld, and other Orlando attractions. Facebook fans 204,553. Twitter followers 38,627. Santa Claus, Indiana About Blog Holiday World is a theme park with top-ranked wooden roller coasters plus Thunderbird launched wing coaster, lots of family rides and shows, plus Santa Claus, himself. Splashin' Safari is one of the world's largest water parks. Both parks for one price. Facebook fans 397,299. Twitter followers 51,525. About Blog Attractions Magazine is the only magazine, television show, newsletter and website that covers theme parks. News, reviews, photo galleries and the latest updates from Walt Disney World, Universal, SeaWorld, I-Drive and tons of other Central Florida Attractions. Facebook fans 140,625. Twitter followers 61,360. Orlando, FL About Blog Welcome to the online campus of Theme Park University, a place for the exploration and critical analysis of live interactive media. Facebook fans 10,620. Twitter followers 1,361. Orlando and Kissimmee, FL About Blog Come discover what makes the ONLY family owned and ran theme park in Central Florida HUGE fun for everyone. Facebook fans 66,525. Twitter followers 7,390. Facebook fans 5,400. Twitter followers 357. About Blog BTT is a news and planning site dedicated to our love of theme parks & haunts. We strive to bring the latest, and best in the theme park world. Through our pictures, videos, planning guides and articles we hope to bring visitors closer to their perfect theme park experience. Facebook fans 11,267. Twitter followers 14,239. Southern California About Blog Theme Park Adventure is the internet's oldest themed entertainment fan site, featuring Disney, Knott's, Vegas, zoos, haunted attractions and more! Facebook fans 6,631. Twitter followers 9,017. Derbyshire, UK About Blog Garmendale is a leader in the design, engineering and build of theme park rides from design, engineering, shotgun gate systems and ongoing maintenance. Facebook fans 637. Twitter followers 238. Chicago and Orlando About Blog Parkeology was started as a theme park blog by Shane Lindsay and Ted Tamburo, offering offbeat and unconventional look at Disney parks past, present, and future. It has grown to include the official WDW47 Challenge. Facebook fans 1,450. Twitter followers 3,491. About Blog Coaster Critic is your source for opinionated roller coaster reviews, theme park tips and a coaster enthusiast’s take on theme park news. Facebook fans 1,510. Twitter followers 1,698. Pembrokeshire, Wales About Blog Visit Wales' biggest theme park – home to Megafobia, Speed and Dahland. Perfect for thrillseekers and families of all ages. Book tickets online to save. Facebook fans 78,051. Twitter followers 8,007. Orlando, FL About Blog News coverage, park updates, videos and tips for Universal Orlando, Walt Disney World, SeaWorld Orlando and more! Facebook fans 156. Twitter followers 459. Facebook fans 2,571. Twitter followers 5,077. Orlando, FL About Blog ThemeParkHipster is the complete source for your solo theme park adventures. ThemeParkHipster.com shows the fun way to enjoy theme parks alone with the latest tips, reviews, news, personal stories, and more! Facebook fans 376. Twitter followers 2,042. About Blog This page is dedicated to all of you coaster lovers out there. My goal is to share my fascination with theme parks to an audience with the same interests. South East, England About Blog Theme Park Trader houses all the latest news and happenings on theme parks around the world including Walt Disney World & Universal Studios! Facebook fans 2,046. Twitter followers 418. Facebook fans 13,775. Twitter followers 52. About Blog Coaster Hub – Theme Park News, Construction Updates, and More. Facebook fans 149. Twitter followers 747. US About Blog ThemeParks-US is your guide to the best theme parks in the United States. It includes Walt Disney World Resort, Six Flags, Universal Orlando Resort, Disneyland Resort, Busch Gardens, SeaWorld and Legoland. Facebook fans 4,818. Twitter followers 2,543. Orlando About Blog Focusing mostly on the Universal Orlando Resort, we are an entertaining resource to preview what you might encounter on a vacation to Orlando Florida. Facebook fans 2,041. Twitter followers 3,982. About Blog CoasterNerds brings you the latest in amusement and theme park related news from around the globe. Facebook fans 15,656. Twitter followers 88. Facebook fans 6,020. Twitter followers 111. Orlando, FL About Blog We Share News & Info on Florida Theme Parks & Attractions, Movies & TV, Marvel, DC, Star Wars, Walking Dead, Funko and Food & Spirits #blogger #disney. Facebook fans n/a. Twitter followers 5,352. Los Angeles, CA About Blog We are the The Park Duo! We are a Husband and Wife team that love everything Theme Park, Haunt and convention related. Check out our podcast on iTunes too! Facebook fans 234. Twitter followers 1,074. About Blog The best theme park news and rollercoaster Point of View site on the web! We cover all Disney, Six Flags, Cedar Entertainment, Universal parks as well as more! Facebook fans 410. Twitter followers 447. Sacramento-Anaheim-Orlando About Blog A theme park blog/vlog covering Disneyland, Walt Disney World, Universal Orlando and more! UK About Blog Theme Park Podcast and Blog. Follow for rollercoaster news, community gossip, cool merch, competitions and much more! Facebook fans 32. Twitter followers 243. About Blog Parks at 115* Longitude. zhengzhou,China About Blog Latest Information About Amusement Park Rides Industry from Sinorides. Facebook fans 36. Twitter followers 1. 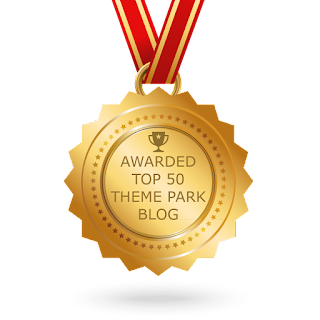 CONGRATULATIONS to every blogger that has made this Top Theme Park Blogs list! This is the most comprehensive list of best Theme Park blogs on the internet and I’m honoured to have you as part of this! I personally give you a high-five and want to thank you for your contribution to this world.